Seasoned and split nets of softwood firewood primarily spruce, pine larch. These logs have been air dried over the summer and are ready for immediate use in wood burners, stoves, and on open fires. Seasoned (air dried) softwood firewood, primarily pine, spruce and larch that has been drying through the summer ready for use on open fires, wood burners, multi-fuel stoves etc. The logs are cut to approximately 20cm and split, which allows them to dry most effectively. The nets contain at least 95% softwood, there is always a possibility that some hardwood managed to get mixed in but not very often! Average weight is approximately 12 - 15 kg each net contains approximately 12 - 16 logs. 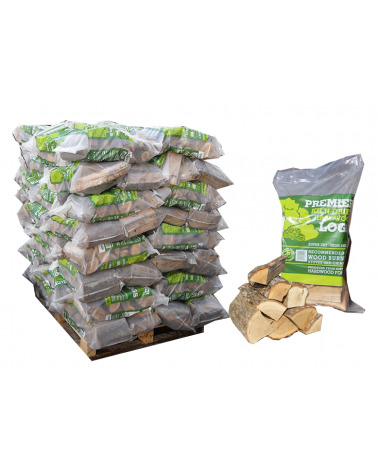 The more nets you buy in one go the more you save, a pallet will hold up to 80 nets of logs! There is a minimum order for delivery of 20 nets of logs, unless you are ordering in combination with other products, you can then order as few as you like. Purchased 80 nets of softwood seasoned logs and they are the best we have bought since having our wood burner. We have used other companies but they fail to deliver quality. Logs are well seasoned , uniform in size and split which makes less work for me. . . . I can just sit and enjoy the fire. Used the pallet as kindling so nothing goes to waste. Delivery was spot on with a great driver who was very helpful. I will be ordering from here again next year without hesitation.